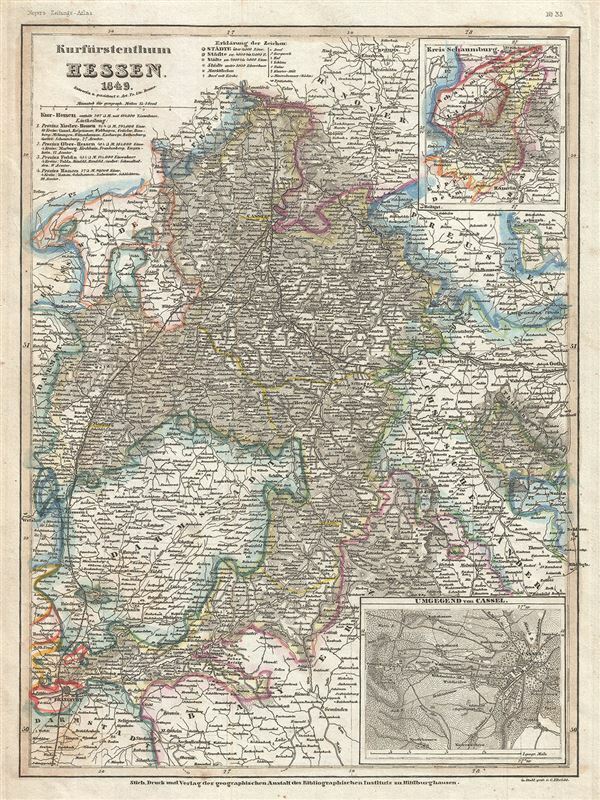 This is a scarce 1849 map of the Electorate of Hesse or Hesse-Kassel, by Joseph Meyer. It covers the modern day German state of Hesse and vicinity from Einbeck south to Frankfurt and east as far as Gotha. Throughout the map identifies various cities, towns, rivers and an assortment of additional topographical details. Two insets detailing Kreis Schaumburg and Kassel (Cassel) are included in the top and bottom right quadrants. When this map was created, the Electorate of Hesse was a state of the German Confederation. Established in 1803 as a state of the Holy Roman Empire, it was annexed to the Kingdom of Westphalia for a brief period, before being reinstated by the Congress of Vienna in 1814. In 1866, following the Austro-Prussian War, it would be annexed once again, this time by the Kingdom of Prussia. This map was issued as plate no. 35 in Meyer's Zeitung Atlas. Although all the maps in this atlas are not individually dated, the title page and maps were often updated while the imprint with the date was not, causing confusion to the exact date for some of the maps. Moreover some maps in the atlas were taped in at a later date as an update to the atlas. We have dated the maps in this collection to the best of our ability.